El viernes pasado pasamos la tarde paseando por la Calle Fuencarral, en Madrid. Una de nuestras calles preferidas para pasear, comprar, mirar a la gente...y ¡si es con solecito mejor! Last friday afternoon we had a walk in Fuencarral Street, Madrid. One of our favourites street for have a walk, go shopping and look for interesting people. And better in a nice weather day! 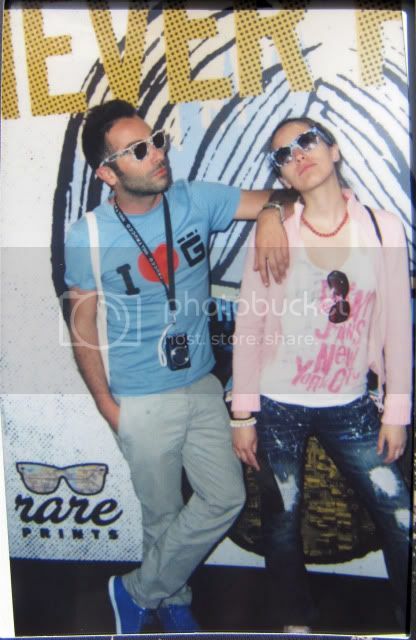 Estábamos foto aquí foto allá cuando se nos acercaron para ofrecernos ir a una exposición de gafas Rayban. Un espacio llamado Rayban Station. While we were taking photos, someone invietd us to go for a sunglasses Rayban exhibition. Próxima parada: RAYBAN STATION: Calle de La Reina núm 11. Un espacio recreado en un vagón de metro donde poder probarte los últimos modelos de Rayban, hacerte fotos y pasar un rato divertido. Next stop: Rayban Station: De de Reina St, 11, Madrid. A place where you can prove the latest Rayban's sunglasses collection. Si pasas por Madrid antes de 5 de Junio, no te lo pierdas! Lun-Sáb de 11 a 21 h.
If you are in Madrid, go to Rayban Station! Mon-Sat 11am- 21 pm. que guay! ah! me encantan tus zapatos. Con lo que me gustan a mi las rayban!!! -Vicente: sí, el azul es uno de mis colores preferidos, sino el que más! -Gloria: vente pa Madrid! jeje. Son zapatillas amor, de Zara. -Pretandpoor: hola! gracias por tu coment, y bienvenida! -Zepequeña: pues no te pierdas la exposic, mola mucho! -Jose: gracias guapo! azul for ever! Qué guapos los dos!!!! Me encanta tu t-shirt!!! Y las gafas son lo más! Pena que no pueda estar en Madrid!!! Ya sabes que a mi la calle de Fuencarral me encanta!! -Anatxu: gracias guapa! la camiseta es de García Madrid, mola! -Tara: siii, la Calle Fuencarral es de lo mejor! -Anotherwomanbyrose: esque pasear por allí mola mucho! desde que es peatonal mejor! Feliz comienzo de semana a todos, ánimo con el lunes. Besos! 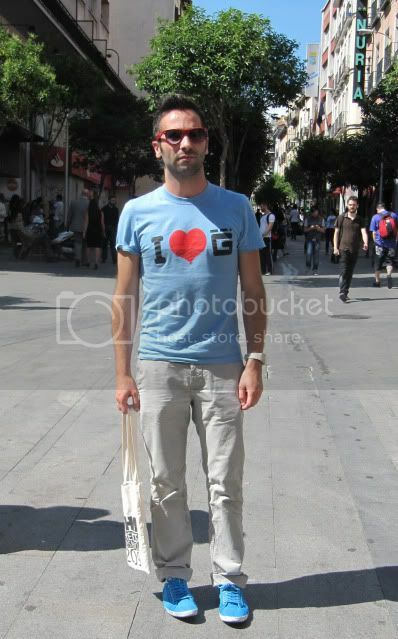 ESTAS GUAPO, GUAPO ESA CAMISETA TE SIENTA MUY BIEN, Y LA EXPOSICION RAYBAN QUE CHULO, NO? Y A QUIEN TIENES DE ACOMPAÑANTE ? NO TE LLEVASTES A COOL ? JE JE JE... BESOTES MUCHOS Y FELIZ COMIENZO DE SEMANA, MUAK !!!! Está genial, la vi y me encantó...qué de cosas tiene esta ciudd! Me encanta esa calle! Tiene tiendas increíbles y un ambiente muy urbanita! -A trendy life: gracias reina! -O'style: guapa! bienvenida! si, es una de nuestras calles preferidas, nunca me canso! Qué buen plan para una tarde de viernes!!. Me encantan tus outfits, siempre originales y arriesgados. -Eva M: a mi lo que me encantan son tus comentarios, siempre agradables! gracias preciosa! qué casualidad!! Nosotros nos pasamos por allí el sábado por la tarde!! Me las llevaba todas, no sabía cuál probarme primero!! Que genial exposición, oh lo que daria por vivir en Madrid. -Javo: vost tb fuisteis! muy bien! -Adrian: gracias Adrian! como me ha gustado ver la foto de Pakito! a ver si pones más. -Vulpini: Sí, Madrid es genial! Gracias por tu comment! Cool pics! I really like the shirt and the gorgeous shade of blue. Me ha gustado mucho lo de Ray Ban, que idea más buena. -Leslee: thnks! and welcome to my blog, always! -Nacho: Cool se quedó en casita, jejeje! "There is clearly a lot to know about this. I believe you built some very good factors in Functions also.Preserve operating ,excellent employment!" Okay, well let me tell you that my computer is filled with worms and all of that, and its pretty bad, because i keep getting a lot of random pop ups every second (I have a Compaq btw) Also i have Alpha Anti virus &i heard that it a fake Protection program, so yeah. Another thing is my computer has gotten REALLY slow, and Alpha Anti Virus is blocking the websites I go on. My cousin told me to look for the programs that end with "xe" or "ex" (i forget) somewhere in my computer where they are hiding. PLease SOMEONE HELP ME . THIS IS DRIVING ME CRAZY! Could someone that knows a lot about computers, and fixing computers, &might possibly be studying for that type of stuff, Could you PLEASE help me. Or does anyone have a number i can call, like a computer fixing hotline or something, so that they can tell what i should do step by step on the phone. Please Someone Help Me!! In New York resident Tip Top Shoes, one of the first US accounts s brand *, is CEO Danny Wasserman Said FitFlop Among the store s top-performing providers. It s from a fabric thong waterproof boots and hiking boots developed christian louboutin shoes Wasserman said of the more robust product range. I pointed to the brand a strong and repeat business has developed. Consumers have the Once [the original flip-flop], they christian louboutin sale come back and are other shoes.§While Wasserman women try 30 years old and older cited as FitFlop s main target group, the store is now for the brand Mizuno Wave Prophecy 2 s to see men, demand s and children lines. the men s Category is the next big thing [for our brand], said Terry. Many mbt shoes people have asked us for [it] . announced Wellness brand MBT Thursday that Joe Casagrande will become President of the US and Canadian divisions, since April 4.Casagrande Mark Matheny will fitflop sale follow that as interim president since last fall was active, fitflop shoes as Paul Grimble leave the company. return Matheny to his previous role as VP of Operations, with Casagrande reported to Jan Stig Andersen, Global President and CEO.Most recently Casagrande headed Sales and Merchandising for New Balance from the Sport specialized, specialty stores, sporting goods and lifestyle channels. He also launched and managed mizuno wave shoes the PF Flyers brand and GM was the New Balance Lifestyle Division. "We see enormous potential for MBT in the US and are fortunate at this time Joe Casagrande take christian louboutin outlet the helm to have," Andersen said in a statement. "His years of proven expertise in product marketing, sales and management of both national and global perspective will be a tremendous mbt shoes outlet asset to the company." The road to success is rarely a straight line, but some shoes entrepreneurs Especially routes Took turns. Ambitions, which began in one place ended somewhere mizuno wave prophecy 3 very different.Here, FitFlop founder Marcia Kilgore shares her path.I up wanted a backup singer Ray Charles "little more glamor and to be artistic. At one point I thought I mbt outlet d love to be in advertising or be a writer, but I came from a very simple life without connections or experience, so [I didn t know] what was fitflop sandals possible.